John and I haven’t been up to too much lately, yet somehow we are always finding ourselves busy… I’m not totally sure how that’s possible, but it just is! Here’s a glimpse of what has been keeping us busy. We are on the tail end of the beautiful Arizona “spring” weather and are starting to head into the hot 90 degree days. We have been soaking up the last of the “spring” sun via pool side sunbathing and patio dinners! 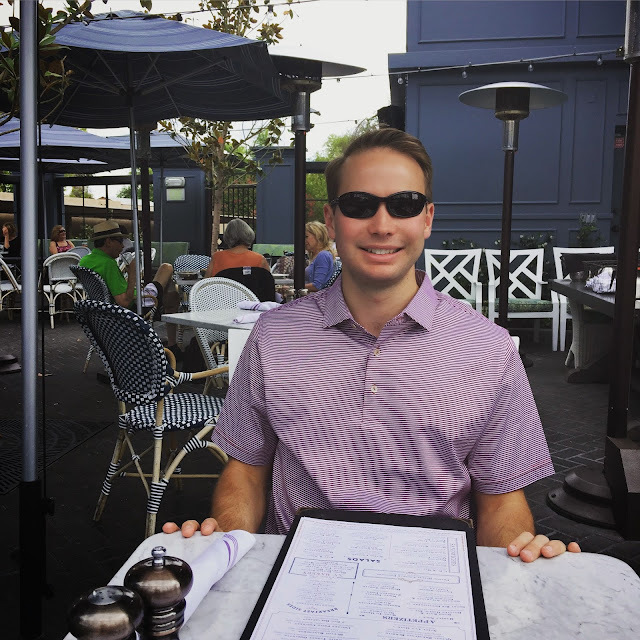 We recently had a patio brunch at The Henry and it was fabulous – such a great atmosphere and not too expensive... you can’t beat that! This past weekend John and I went to Sedona and hiked Devil’s Bridge. We originally intended to go on a hike in Flagstaff, but by the time we got there, it was raining! We made a change of plans, and decided on Sedona. 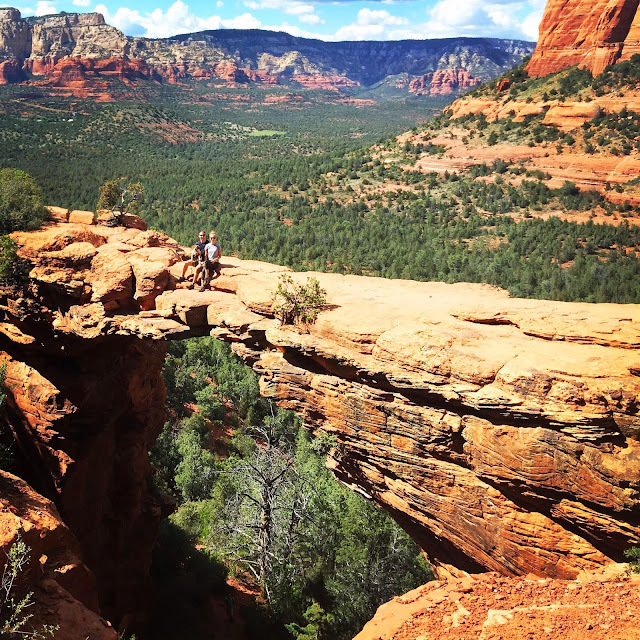 We have been wanting to hike Devil’s Bridge for a while (and in fact, it was on my spring bucket list), so this seemed like the perfect excuse! The views were incredible, and the beauty of Sedona’s red rocks are never lost on me! Scout joined us on our hike, and we were surprised (and very thankful!) to find out that she is scared of heights! Despite her fear, John still insisted on carrying her out on the bridge (anything for a picture, right?!). And, for the most exciting part of our lives lately, John and I will be celebrating our fourth anniversary this summer with a trip to Europe! We will be going to London, Paris, and Rome, and we are pretty dang excited about it. To prepare, we have watched an obscene amount of the travel genius Rick Steves (thank you, HuluPlus), and every two seconds I look at John and say "you’re remembering this, right?!" I have never been to Europe, and I feel so blessed that I get to go explore with my best friend! In college I traveled around Southern Africa for six months (which was obviously amazing), but there is something about making memories with your life partner that makes international travel extra special! So please! Spill all your Europe travel tips and tricks!! The count down is on... only 49 more days! I am totally envious of all of the gorgeous hikes y'all get to take over there in AZ! And yay for your European anniversary adventures - so fun. Yay for a trip to Europe this summer! Y'all will have the best time. Oh your trip is going to be so fun!! What beautiful scenery at Sedona too! Gorgeous! Oh girl. I have so many notes for your trip!!!!! I actually posted about Rome today, but I seriously have so much more. We will be chatting more! ;) I've heard Sedona is gorgeous, so you clearly made a good choice!!! I didn't know dogs could be scared of heights! That's really interesting. That hike looks gorgeous, though I may be right there with your pup! And what an amazing trip you guys have coming up, I can't wait to follow along and hear about all the details! Yay for Europe!! That sounds like so much fun! Your trip will be so fun! When I went it was on a cruise that docked in different Euro cities..but I've always wanted to go back and explore it the right way! Your trip to Europe is going to be so amazing! There's so much to see and learn! I was born there and try to go back to visit my family as often as possible. Omgosh, you are going to have soooo much fun on your trip! We went to London for our honeymoon two years ago, and it was AMAZING. We definitely took advice from Rick Steves too. He has some great thoughts on the Underground Tube system that I would definitely recommend if you plan on using it for more than a few days. Let me know if you have any specific questions, and have so much fun! I am so jealous of your trip to Europe! I cant wait to see all your pics! So funny how we can be busy and have nothing to do at the same time! Gosh, you guys have the most beautiful hikes – I’m always so jealous!! Eeek! I’m so jealous of your trip – we’re currently trying to decide on whether to do London this summer or wait until next when we have more time to plan, ha! WOW!!! What an exciting way to celebrate your anniversary!!!! Have so much fun in Europe!!!! That's going to be an AMAZING trip!!! So much fun! Can't wait to hear all about it! I can tell from the photos that the scenery at Devil's Bridge is breathtaking in person. Look at God's beautiful handiwork. that hike looks gorgeous and that trip is going to be awesome! Paris is fantastic and Rome is one of my favorite places ever! Woohoo! I'm so excited for you! You are going to have the most amazing time! 49 days! How are you even sleeping!?! Yay!!! So excited for your trip! We will be just missing you :( We will be in there in July. I can't wait to see everything you do, and add it to our list as well! I highly recommend going to the cafe on the rooftop of Printemps (it's a store like Macy's). Best view of Monmartre and the Eiffel Tower. Also, be sure to visit both sides of the Eiffel Tower, and go back at night! Sedona is always gorgeous! So excited that y'all are doing Europe for your anniversary. I adore all that is London, so let me know if you have questions. Use the Tube and your feet. It's way cheaper than a cab. There are so many fabulous places to see! I could write you a novel! Ha. My parents and brother love Paris and Rome. David's tip for Paris would be a bike tour at night. And his favorite thing for Rome is Blue Ice Gelato at the Trevifontein/Spanish Steps. That trip to Europe sounds amazing!! 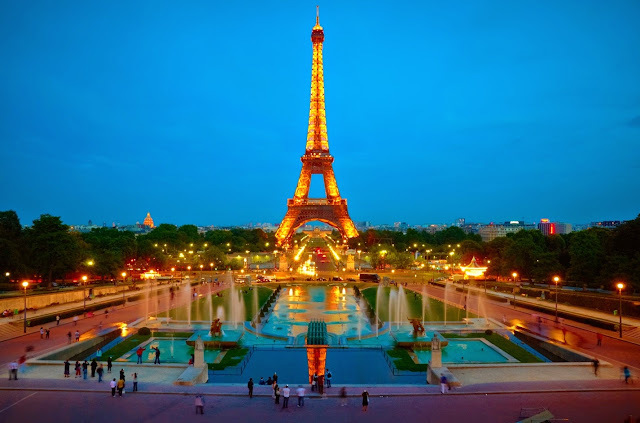 I've only been to Paris on your list, but I LOVED it!! Your weekend also sounds great, and that photo is sooo pretty! We were in Rome in December so I can give you the tips and tricks we used while we were there. I'm no help on the other two places though :) Y'all will have such an amazing time!! I'm so glad you get to go. I want to see England someday. I hope you two have fun in Europe! I have not been, but I read this tip somewhere: be sure to ask for the "toilet" if you have to do bathroom business. If you say "powder room" or say that you need to "wash your hands", you might be directed to a washroom that only has a sink and/or tub, not a toilet. So jealous… I've never been to Europe but I'm dying to go! Ahh! So exciting to go to Europe!!! Can't wait to hear all about the planning. Such a pretty photo! Did y'all have someone else take it?? Beautiful! Isn't it crazy that it can be rainy in Flagstaff and sunny and clear in Sedona?! London is a fantastic city! Lots of things are free to see & do! 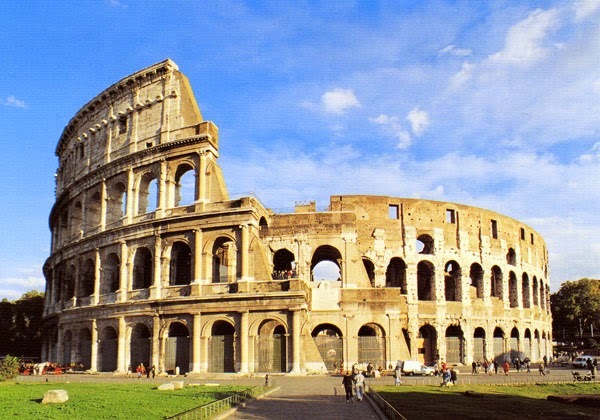 Just spent a semester there & also travelled to Rome/ Paris! I'm so jealous you get to live near such awesome and beautiful hiking!!! Have a great time in Europe, and if you can make it as far north via train to Cinque Terre, you guys will love it!!! It's right up your alley since it's a hike along the Italian coast through 5 fishing villages. It takes about 4-5 hours and is fairly intense because of the inclines. It's worth every single minute, though. If you are taking the trains as a mean of getting around Western Europe, it would be a great stop for a day trip on the way from Paris to Rome or vice versa. If not, you can find plenty to do in those cities! When you're in Paris, make sure to go the back side of Sacre-Coeur and check out the sweet little garden back there. It's very pretty and a great place for a picture. It's been over ten years since I went to Europe, so hopefully I'm not wrong! You'll have a great time whatever you! Cauliflower Alfredo with Quinoa Noodles!